Radiographs play a critical role in the diagnosis and treatment planning of various medical and dental conditions. Professionals in the field of medicine and dentistry rely heavily on radiographic findings for better understanding of the location, position, extent and nature of the abnormality, infection or disease that they are dealing with. - Portability and Easy Usage: The digital x-ray equipment is much smaller, lighter in weight and is therefore portable, easy to carry and offers convenience in handling. Previously, a separate room was allocated for x-ray taking due to the large size of the equipment and the amount of radiation it exposed the patient to; digital x-rays on the other hand can easily be taken while the patient is comfortably seated in the dental chair. - Highly accurate: Radiographs produced by the digital system are more precise as compared to the conventional technology. 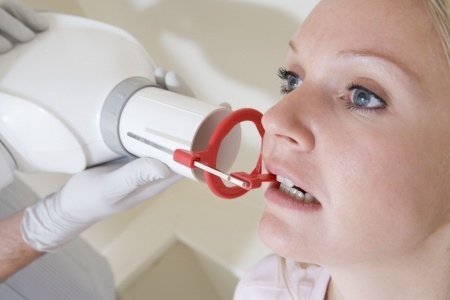 These X-Rays allow for better detection of abnormalities in the oral cavity. - Elegant design: The cone beam system was large, rather complex and tricky to use. The digital x-ray equipment on the other hand is far more elegant, sophisticated and simple in every respect. - Less radiation exposure: Perhaps the greatest advantage of using the digital radiograph system is the fact that it releases a very small percentage of radiation as compared to the conventional x-ray system, which is safe and does not pose any threat to health or wellbeing of the patient. - Efficient: Digital X-Rays are more efficient and save the dentist and the patient a considerable amount of time. The x-rays taken in this manner can conveniently be viewed on a larger screen in high resolution for ultra-accurate treatment planning and diagnosis. Radiographic film is not required to view images in the digital system. At Buckingham Family Dental, we use state of the art dental technology to ensure your complete satisfaction every time. Book an appointment today to experience the difference!